​Whether you're munching on a pie on the sideline watching the Pokolbin Reds play rugby or dining fireside on a restaurant shepherd's pie, it's hard to resist a good pie in winter. Here are some top spots where you can tuck into a tasty pie. "Whether it's being eaten as a snack or a meal, a pie is ideal for winter as it is rich, warm and tasty, however we do serve pies all-year-round," says chef Robert Molines. "In France we call an enclosed pie a Tourte, but being an Aussie now I call my Leek Tourte a pie," adds the French-born chef. "I use a blend of slow-cooked leeks and other tossed vegetables to this dish and enclose the creamy filling in puff pastry. "Of course, you can use other pastry if you like. For instance in Greece filo pastry is used, but I prefer puff. I serve this delicious pie with a chervil hollandaise, sautéed baby leeks and cherry tomato with a bit of parmesan. And I like to wash it down with a glass of Molines et Fils Chardonnay." Chef Andy Wright pairs one of winter's most-loved dishes – lamb shanks – with a comforting shepherd's pie for the ultimate cool-weather double dish. "The pie is a 'shepherd's pie' so it's not a pastry pie and it's always made with lamb (cottage pie has beef)," he explains. "For the pie, I marinate local Milly Hill Farm lamb shoulder then braise it for six hours, shred it and mix with carrot, onion, celery and leeks. We put this in a metal ring, pipe pumpkin purée on top and bake in the oven for 15 minutes. "The lamb shank is also marinated and braised for six hours, the sauce is then reduced, and the meat just falls off the bone. We serve the shank with the shepherd's pie, buttered spinach and gremolata." And Andy's wine match? "This dish is great with a 2016 Brokenwood Shiraz." "Our beef and Guinness pie is on the menu year-round as it's our most popular dish," says chef Netra Subedi . "Diners love it, particularly on a chilly winter night." He slow-cooks Australian beef in Guinness for several hours with fresh button mushrooms, smoked paprika, Dijon mustard, garlic, cracked pepper and herbs with a rich brown gravy and flaky puff pastry. 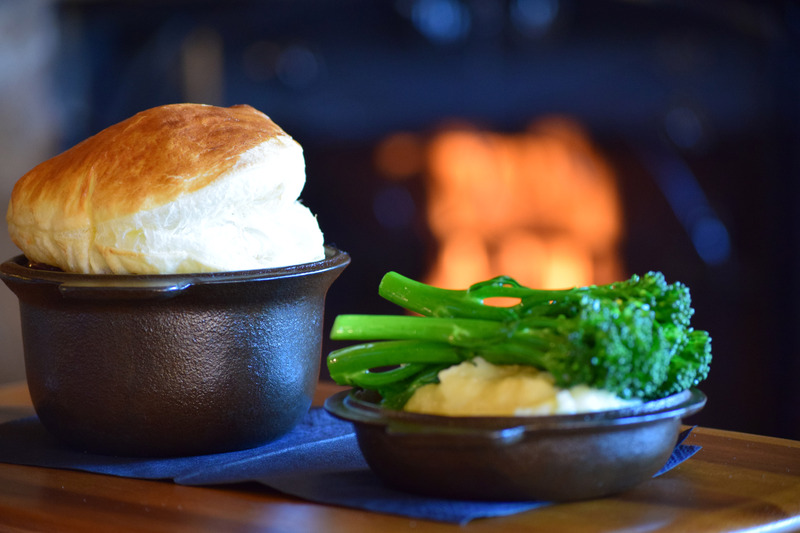 It's served with a side dish of creamy mashed potato and broccolini – a classic heart-warming winter meal, that's even better with a glass of Hunter Valley Shiraz. Best Pies EVER! screams the headline on the TripAdvisor review for Two Fat Blokes Gourmet Kitchen. Who could ask for a better recommendation than that?The deli/cafe makes a range of savoury pies, all made in-house. There are six varieties which you can buy at the deli counter. They've got everything from chicken and leek pies, pork and fennel pies to bacon pies and mushroom pies, but what do the punters like best? "Pepper Beef Pies are our most popular," says co-owner Julie Molennar. "But the Satay Chicken Pie is a close runner-up." So, where are the best pies you've tried in the Hunter?